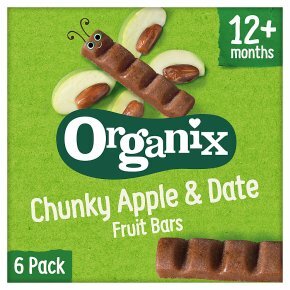 Suitable for vegetarians.For little explorers on the go... our delicious apple & date chunky fruit bars are 100% fruit squished into bite-sized pieces. Each chunky fruit bar counts as 1 of a child's 5 a day. Safety Advice: Not suitable for children under 12 months. When feeding a child, please ensure that they are sitting down and are supervised to reduce the risk of choking. Every care has been taken but date stone fragments may remain.<br>Important Information: This food has no added colouring but the natural ingredients may cause staining.